SAN FRANCISCO – April 25, 2013 – PlayFirst® Inc., a global leader in mobile games for family and friends, today announced Deep Sea Deli, a quirky puzzle-match arcade title, available now on the App Store for iPhone, iPad, and iPod touch. In addition to introducing a new and endearing PlayFirst character, Narly the Narwhal, Deep Sea Deli advances the puzzle-match genre by being the first game to combine limitless play-sessions with strategic depth and social competition, all in an undersea setting filled with lighthearted and witty humor. 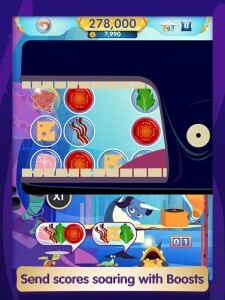 Players can download Deep Sea Deli for free on the App Store or view the game in action with the official trailer. In Deep Sea Deli players meet Narly, a down-on-his-luck former hotshot in the terrifying sport of tusking. Narly finds inspiration one night when a storm tosses and turns a cargo ship until a deluge of deli meat goes tumbling into his reef, complete with a slice of swiss cheese hung handsomely on his horn. Seeing his friends go nuts for the land-based lunchmeat, and eyeing the entrepreneurial chance of a lifetime, Narly dons an apron and opens a diner of his own. Unlike many puzzle-matching games, Deep Sea Deli doesn’t enforce a time limit on play sessions; it’s all about skill and careful sandwich-smithing. Charming tunes and vibrant effects accompany every tap of the game’s intuitive sliding mechanic, adding personality as players quickly assemble “submarine” sandwiches while clearing a grid of bubble-bound ingredients. But to turn up the pace and earn high scores, Narly’s friends can help when players are in a pinch, like Monstro the whale clearing a board or Hungry Hoover gulping down stray ingredients that players can’t use. Other boosts include time-buffs for bonuses and, of course, wads of mystery meat that players can slap into any sandwich for extra points – if they’re quick enough to earn them. Use the ingredients wisely, and players will reel in bonus points and swim up the leaderboards in no time, perhaps even winning one of Deep Sea Deli’s weekly tournaments. 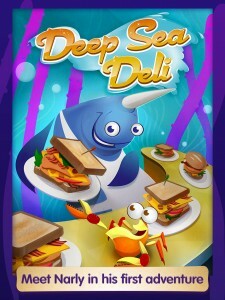 Deep Sea Deli is now available for free on iPhone, iPod touch, iPad, and iPad mini via the App Store. Fans – Head to Hawaii in the “What’s in the Water” Contest! Fans can visit www.whatsinthewater.com to not only find out more about Deep Sea Deli, but also enter to win a variety of prizes, including an all-expenses trip to Hawaii with a submarine tour and Deep Sea Deli-branded merchandise. The contest is open until May 3rd, so visit the site today! At PlayFirst, we believe you can have fun anywhere, any time and at any age. That’s why we’re committed to creating mobile games for everyone to enjoy, including the fan-favorite DASH® series of games like Diner Dash® and SpongeBob Diner Dash®. Whether you’re in line at the store, on your lunch break or lounging at home, you only need a minute to dive into a PlayFirst game—but you’ll find a lifetime of entertainment. PlayFirst games are played by tens of millions of fans worldwide, and we’re just getting started. To find out more about our talented team and our awesome games, please visit www.playfirst.com. To download the full press kit for Deep Sea Deli, click here. To view the Deep Sea Deli trailer, click here.